Professional cooks get lots of burns on their hands and arms, but us home cooks like to keep our scars to a minimum. These mitts are particularly useful when reaching into a hot oven or making candy, which requires one to heat the sugar to such a high temperature that the pan gets extremely hot. In addition to making frosting a cake much easier, this handy tool does double and triple duty getting baked goods (like pie) out of the pan neatly, scraping "stuck" cookies from the cookie sheet and so much more. This tool takes the guesswork out of candy-making and frosting-making involving sugar syrup. If you don't have one, you can still make these treats -- you just need to continually drop a bit of the syrup into a glass of cold water until it "spins a thread," "forms a soft ball" or "cracks," --- or whatever the recipe calls for. I'd rather just read the number on the side of the thermometer. Hotel pans are large, heavy aluminum cookie sheets with a rim around all sides. These are great for baking cookies, for putting under a pie while baking to catch overflowing juices and make an ideal platform for roasting vegetables. Good quality cake pans, with straight sides, will increase your success with cakes as they will heat evenly. Having one of these around allows you to weigh (instead of measure) ingredients like flour, sugar, chocolate and more. For example, I buy blocks of chocolate and also the extra rich Plugra butter in one pound blocks and just weigh out what I need --- no need to rely on the measurements printed on the paper surrounding sticks of butter. Forget traditional flour sifters. Just use this for flour, confectioner's sugar, cocoa powder and more. Pile the dry goods in the strainer, give it as shake (or push the goods through with a large tablespoon). Later you can use it to strain the green beans for dinner. There's a difference between these. Wet measures are those glass ones that have the amounts printed on the sides, so you can measure out anywhere from a 1/4 cup of milk and up (depending on the size of the container). Dry measures are more amount-specific -- they usually come in 1/4, 1/3, 1/2 and 1 cup sets and you fill each to the brim with the dry ingredients (like flour or sugar) and run the flat side of a knife across the top to make ingredients level with the container. OK, I know I'm sneaking two items (again) in one post, but both of these are really helpful in mixing and baking almost everything. 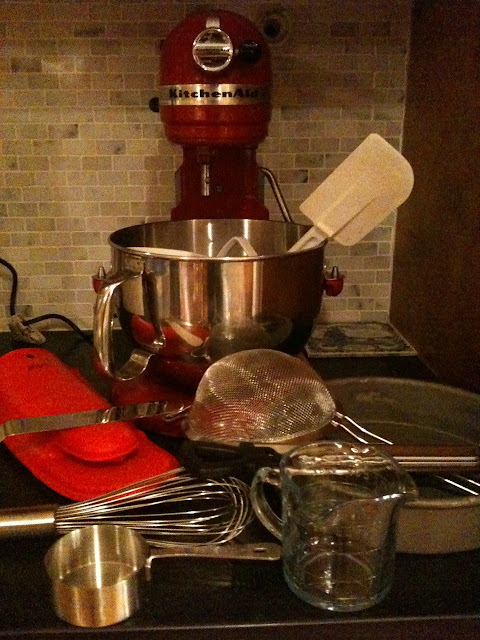 The wire whisk is great for everything from beating eggs to mixing dry ingredients together. And the spatula is an excellent vehicle for scraping the batter from the bowl into the pan (and for licking clean a few moments later). If you can, get a spatula that can withstand high heat -- I recently melted one at my mother's house while making frosting. This may be the only essential item on the list! So many recipes call for an electric mixer with a flat beater. I only own a hand mixer, which doesn't have a flat beater. How does one adapt, or is it just not possible? Hey, thanks! I was thinking that you weren't going to take my question seriously, but it was a very legit. q. So here's my followup, if you don't mind: How do you match the speeds on a KA to those on a hand mixer for a recipe, and would the mixing times remain the same? Barb: I'm not exactly sure. Most recipes don't give "times" but rather, "results." Like mix until "light and fluffy" or mix "until it forms a ribbon when the beater is lifted." And I think this is done because different mixers have different power levels. I know that using a hand mixer takes longer (at least mine does) to achieve the same result, but it will get you there!